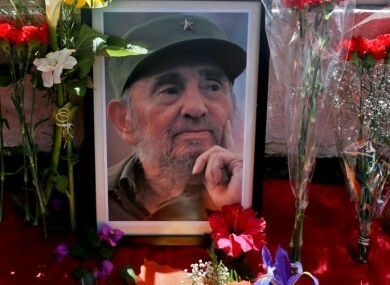 The death of the former Cuban leader has sparked a mixed response. PRESIDENT MICHAEL D Higgins has been criticised for praising the late Fidel Castro. The death of Castro (90), who led Cuba for almost 50 years, was confirmed by his brother, current Cuban president Raul Castro, early yesterday. In a statement, President Higgins said he learned of Castro’s death with “great sadness”. “Following the revolution in 1959, Fidel Castro brought significant political and social change to his country, overcoming not just the regime of General Fulgencio Batista but also the economic isolation forced upon Cuba in the years that followed. “Having survived some 600 attempts on his life, Fidel Castro, known to his peers in Cuba as El Comandante, became one of the longest-serving Heads of State in the world, guiding the country through a remarkable process of social and political change, advocating a development path that was unique and determinedly independent. Cuba achieved 100% literacy many years ago and built up a health system that is one the most admired in the world. With economic growth rates similar to many other Latin American countries, inequality and poverty are much less pronounced in Cuba than in surrounding nations. Higgins’ statement said Castro will be “remembered as a giant among global leaders whose view was not only one of freedom for his people but for all of the oppressed and excluded peoples on the planet”. Higgins’ comments have been criticised by a number of people including Renua leader John Leahy. A statement released on behalf of Renua said: “Whilst we understand the necessity to be tactful in speaking of the dead, particularly when the dead were recently leaders of other sovereign states, we do think it important to note that Fidel Castro was a dictator, and a brutal dictator at that. Leahy added: “It’s important that we remember that people suffered under Castro. An entire country suffered under Castro. The man destroyed the free press, jailed and tortured democrats, priests, homosexuals, and anyone who tried to stand against him. I, personally, cannot accept that the President speaks for me when he talks of him as a champion of the oppressed and the excluded, when he talks of him as if he was a normal politician who made a few minor mistakes. Fidel Castro murdered, tortured, and jailed all those who opposed him, and he should be remembered for his victims. RIP Fidel. But if Cuba was as brilliant as many on the left believe, why did millions flee, 100s of thousands of them on makeshift rafts. While Cuba begins nine official days of mourning, others have taken to the streets to celebrate Castro’s death, including Cuban exiles in Miami’s Little Havana. Email “President Higgins criticised for praising 'brutal dictator' Castro”. Feedback on “President Higgins criticised for praising 'brutal dictator' Castro”.